Somehow we could not get the internet connections to work reliably but it suddenly works. Results of the 45 minute crit. Jan eke Sindram is out doing her hour run. 15 minutes in, she is averaging 29.202 mph. Mike? What have you got in your records trunk for women's hour? 46.505 kmh - a new world record for Janneke! This is pretty - no damn good - for a lady who just started racing this year. Her first record attempt is a good one!!! But no one is anywhere near the WR. Second run within 5 min. my timing was off. I'm not sure if Bas vd Kooy broke a youth record. There is a 200 m record - a junior record but Sean has to watch out. Sean, you have to come over next year to make sure Bas does not take over. Also note Bas's kilo record; 1:07.424 is just 0.91 slower than the old adult record. Good thing that Sebastiaan set the record a bit tighter - this keeps us reminding there is still a difference between junior and adult records. Configurations to everyone, it looks like it was a great event! Did I read that right? 1:01 in the kilo? Isn't that way under the bent record, and not far from the DF record? 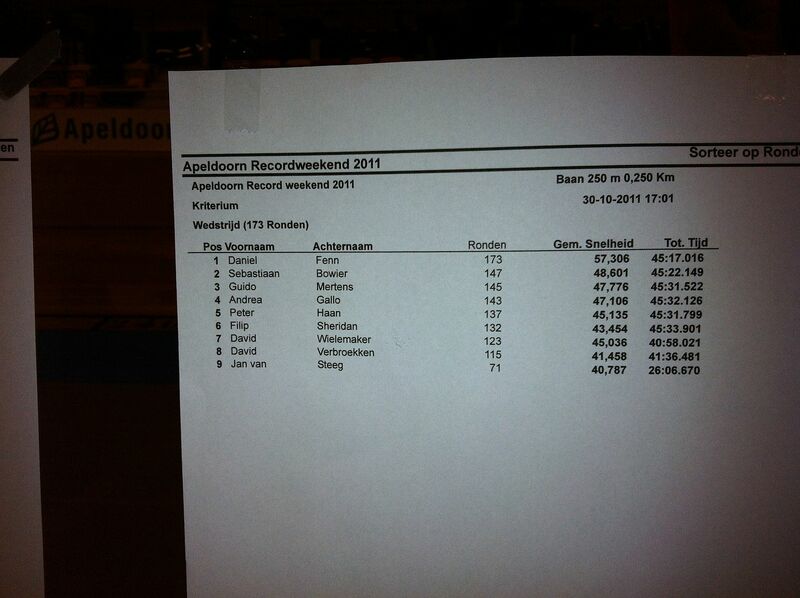 Fastest unfaired km was 1:05.414 by Sebastiaan Bowier. Which is 1+ second under the old record. On the open road, Daniel can reach 80+ kph in his K. On this track, the corners limit him to 67kph. His peak power, at the start, was 1339 watt. His 1st lap was the fastest of all 1st laps on the 1k. Yanneke went as fast as she could. She was utterly exhausted. I think it took half an hour before she was able to stand again. The criterium was fun, I seem the be getting in shape again. Next time I'll bring my homebuilt carbon 'bent. That is a sweet velocar. Seems it might end up on its side quite abit in general use. Very narrow. A good 24 hour machine, maybe? A 1:05 kilo? Wow. More track width than a Quest (64 vs 61cm or so) and because of the low c.o.g. and the stiff suspension, the cornering is fabulous. (for a VM) On of the reasons I ordered one. Should be ready within a week. Buy two and send me one. Just for testing, of course. Hee hee. 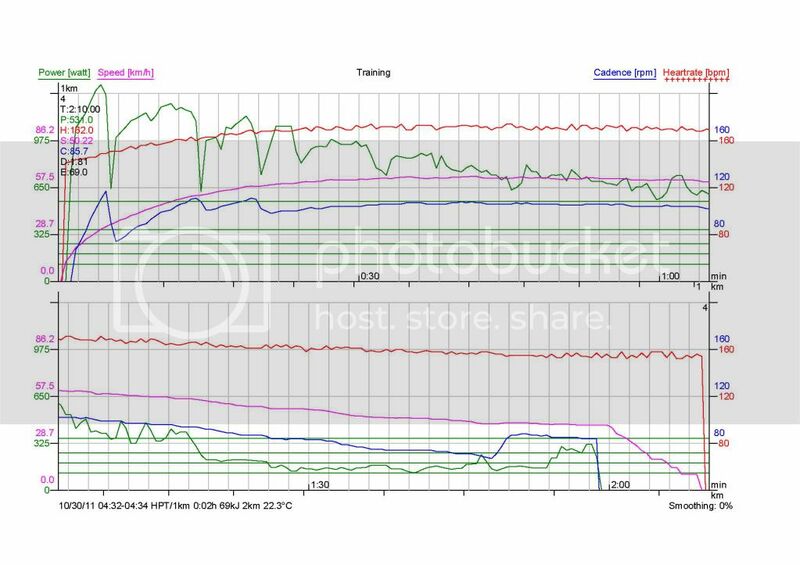 David just send me the SRM data from my kilo run. And summond me to post it. I'd like to see srm data from the other riders. I would think your heartrate would be climbing rapidly throughout that minute+ effort, on its way to 200+ bpm if it had a long enough time to get there. I just looked at a kilo effort of mine and it starts at 650 W and tapers to 250 W at 1:20. I guess you can do that with one leg. Sebastiaan is the new Superman! 1) Sebastiaan Bowier, VeloX unfaired, 11.284 seconds 63.807 km, 39.648 mph. 3) David Verbroekken, Razz Fazz unfaired 12.203 seconds, 59.002 km, 36.662 mph. 4) Guido Mertens, 15.895 seconds, 45.297 km, 28.146 mph. Sebastien's kilo is really impressive considering that he was riding a front wheel drive bike which tends to limit the amount of power you can apply without wheel slip at the start. Those wood tracks are very slippery. I had issues with my rear tire slipping when I was there. I'm wondering if he used any tackifiers on his tires for better grip? I'm thankful to keep the 200 record. I know it won't last long. I am still recovering from last weekend. Hans tried to fly his magic broom to all places where he was needed, I was running around half of the time to see if we could get the internet up&running, Garrie spent most of his time updating the forum using his 3G enabled iPad (I hope his bill will still be acceptable) and some others chased us and the riders to capture these moments on photo. Next year - Yes we will do this again in 2012 - we need to do this differently. Yesterday we dropped of Garrie at the Airport and on our way back home Hans, Ellen and I already collected a number of action items. we will be looking for volunteers for 2012. So if you liked the event this year, please keep track of our website and this forum. We will be asking for your help! Also, this event could not take place without the sponsors (Hans just tricked Challenge Recumbents into becoming our first new sponsor!) and - let's not forget this - all riders and visitors (both on-site and through internet). So a big thanks goes to all of you. Without your presence this event would not have been possible. Thanks and hope to see you all next year. An exact date is not yet known but we are aiming for the last weekend of October, like last two years. Was Janeneke Sindram's mark submitted to the WRRA for approval for a new women's unfaired hour record? Let's get this record documented and recorded at the WRRA site so everyone is kept up-to-date.